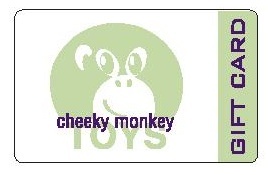 In Store Cheeky Monkey Toys Gift Card. This currently can only be used in our physical store (in Menlo Park) and the gift card must be physically present. 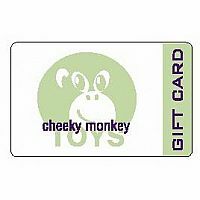 Please treat the card as cash - we cannot replace lost or stolen gift cards. We will mail the gift card for free to your Ship To address (note these ship via US Postal mail and do not have a tracking number by default). You may also select In Store Pickup to have it held at our store for you. You can also add gift wrapping and a gift message to this card. Please select the amount of the gift card below.